Following up on an earlier post on John F. Studstill’s flight from justice at Ray City, GA.
Detective Tucker reached here Thursday with John F Studstill from Bowling Green Fla where he arrested him Sunday morning while Studstill was on a visit to his uncle says a special from Milltown, Ga.
Detective Tucker had a minute description of Studstill and was on the lookout for him. Early Sunday morning Studstill came out of his uncle’s house with the intention of going up town when Detective Tucker stepped up and told him that he had a warrant for him from Arkansas. Studstill signified his willingness to go back with the detective as he told him that the charge that they had against him was small and he was satisfied that he could satisfy the banks there by returning their money and they would release him. Detective Tucker and Studstill reached the home of his father yesterday and spent the day with the home folk before beginning their journey to Ashdown, Ark. Sheriff Avera learned that Studstill was in the county and drove down from Nashville to pick him up on a warrant that he had from Sparks but found that he was in the hands of Detective Tucker. The sheriff went back without his man. Sheriff Avera had quite a long talk with Studstill. He said Studstill did not appear to be worried and talked freely of how he was treated in Ashdown. Studstill said that he went out there and let it be known that he was In search of a farm. He Was taken In charge by the president of one of the banks and was driven over the country in the president’s automobile. He made the presidents home his home and finally bought the farm drawing a draft on the Bank of Milltown covering the purchase price. 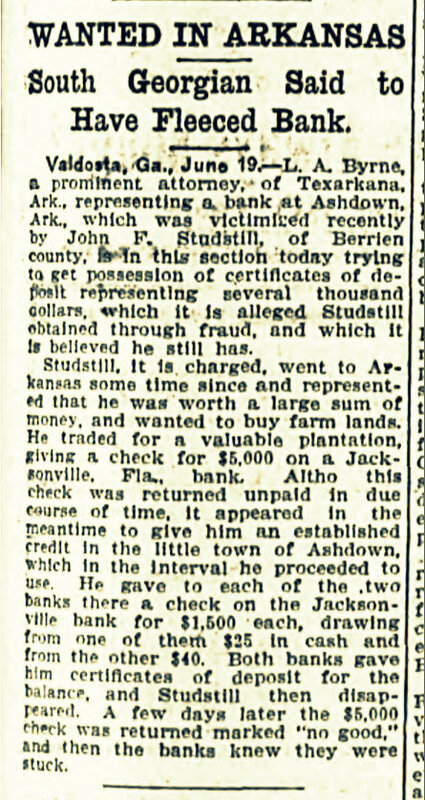 Studstill told him about going to Macon and of the deal that he tried to make there for an automobile in which be offered in payment one of the certificates secured from the Ashdown bank. He said that the dealer wouldnt indorse the certificate but offered to send Studstill to Sparks in the machine and collect for it there. Studstill told the sheriff that he went to Valdosta immediately after trying to make the change of the certificate with the automobile dealer. He stated that he got off the blind side of the passenger train at Valdosta and walked to his father’s home here. He stayed here with his father two or three days and left for his uncle’s home in Florida where he was finally captured.